Every little girl dreams of being Cinderella and marrying her Prince Charming - and we've got the perfect cake balls to accompany your Happily Ever After! Our swirled cake balls and cake pops are beautifully elegant and can perfectly compliment any venue. 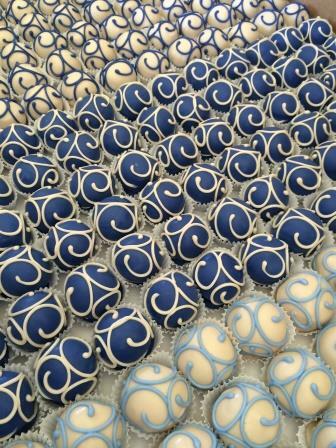 We especially love these blue swirled cake balls we made for a Fairy Tale themed wedding. We dye all of our own chocolate and can match your color scheme perfectly. Email us today at info@cakebites.biz to discuss options for your wedding.